You don't have to live with water retention or edema in legs because most cases of fluid retention can be alleviated with simple lifestyle changes. Learn how! You should pay attention to swelling of the legs because it could be water retention in the legs, or edema. Edema occurs when fluid builds up in the legs, usually the ankles, and causes inflammation and pain. It can be treated with some fairly simple measures if it is not a serious problem. Water retention in the legs that occurs for no apparent reason could also be a far more serious problem. 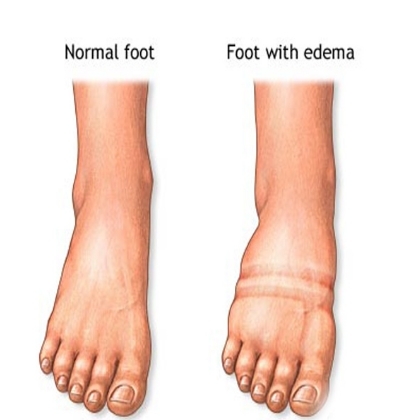 Therefore you should be aware of the causes of edema as well as potential treatments. What Causes Water Retention in Legs? A certain amount of physical activity is needed to stimulate the lymphatic system, which regulates the fluids in the body. If you have to sit or stand for long periods of time, you can prevent edema with just a little exercise. Simply taking a short walk or moving your legs a little can prevent fluid retention. Physical inactivity can make fluid retention caused by health problems worse. The kidneys are the filters that are supposed to remove excess fluid and waste from the body. Water retention symptoms with no visible cause can be a sign of kidney problems. You will need to seek medical treatment if you think kidney troubles are the cause of edema. Edema can be a sign of heart problems, particularly if it is accompanied by other signs of heart trouble, such as pain and breathing troubles. Serious water retention can be a symptom of high blood pressure because the heart is pumping too much, and it can also be caused by some blood pressure medicines. Congestive heart failure often results in serious water retention. The weight of a baby in the uterus can cause a fluid buildup during pregnancy, leading to water retention in legs. The good news is that this will clear up once the child is born. Diets that are deficient in protein, high in salt, or lacking in certain vitamins, including B1, B5, and B6, can cause fluid retention in the legs. Persons on certain kinds of diets, including vegan and vegetarian regimens and some low fat diets can be more at risk for edema. There are some drugs that can cause water retention, including some birth control pills, hormone replacement therapies, and drugs that contain estrogen. Popular pain relievers that contain non-steroidal anti-inflammatory (NSAIDS), such as aspirin, naproxen sodium (Aleve), and ibuprofen (Advil), can cause retention. Some beta blockers prescribed for heart problems are also sought to cause edema. Many women develop water retention during the second half of their menstrual cycle. This occurs because of estrogen imbalances. A person who is suffering from chronic inflammation can suffer from water retention. Inflammation causes the release of histamine, which causes capillary leakage that can lead to long-term water retention. This might be accompanied by other health problems, such as arthritis or gout, which are also related to inflammation. A few other health problems, including allergies, Cirrhosis (scarring of the liver), infections, and thyroid disease, are known to cause water retention symptoms. Many people suffer from water retention because they do not drink enough water. Drinking 8 to 10 glasses of water a day can flush out the system and get rid of edema. Both over the counter and prescription diuretic medications can reduce fluid retention without causing vitamin deficiencies. You should ask a doctor or pharmacist which product you should take. Eating foods rich in B vitamins, such as fresh, green leafy vegetables like kale and spinach or whole grains, can limit retention. Berries and other fresh fruits that are rich in antioxidants can help the body naturally get rid of excess fluid, too. Lying flat can make retention worse, so try propping up your knees and ankles when you sleep or rest. If your job requires you to stay on your feet for long periods of time, support stockings can apply gentle pressure and encourage proper circulation. These are available at most drug stores. Cold compresses made from yarrow tea can relieve swelling and reduce inflammation by drawing out fluid. Yarrow can be ordered online or purchased from health food stores. Foods like celery, lettuce, onion, carrots, asparagus, tomatoes, and cucumbers are natural diuretics that cause the body to release excess water. Eating more of these and less meat and fat can help ease retention. Alcohol, soda pop, coffee, and tea can all dehydrate you, which could make fluid retention worse. Replace these drinks with water if you want to avoid fluid retention in the legs. Regular physical activity and movement can relieve water retention. Try to exercise for at least 30 minutes a day and to move two or three times an hour. If these measures do not work, you should seek medical treatment because water retention in legs or edema can be a symptom of serious health problems.